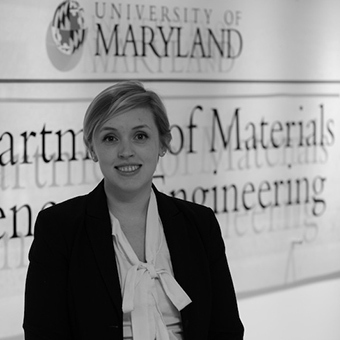 We chatted with Sarah - who graduated in December, 2017 - to learn more about her experience in the Materials Science and Engineering undergrad program, and to find out why she chose the University of Maryland for her studies. I chose to study at UMD because the Clark School has a great reputation as an engineering school and a wide variety of engineering majors available. UMD is also convenient to me; I was living in Rockville when I decided to return to school for engineering, so UMD was a natural choice. I heard about MSE through a friend who suggested MSE because it is “just like cooking.” I am not that easily convinced, so I took classes in several engineering disciplines to narrow down what field I wanted to study. I ultimately chose MSE because it is technically rigorous and allows me to explore all aspects of engineering – electrical, mechanical, chemical… you name it, MSE covers it. Yes, I have conducted both on-campus and off-campus research. From January of 2016 – May 2017 I worked in the Center for Nanophysics and Advanced Materials (CNAM) on campus. I had the privilege of working in a lab with a 20T magnet and ~10mK dilution refrigerator. As a scientist and engineer, it was very exciting to have access to such extreme fields. In my research for CNAM, I worked on developing a self-oscillating electric circuit based on samarium hexaboride (SmB6). I also did some work on lanthanide doping of the heavy-fermion superconductor CeCoIn5. Though the electrical properties of the materials I studied were exotic, I built fundamental lab skills which have served me well in work and school at CNAM. I presented my research on SmB6 at APS March Meetings in March 2017. Since June of this year I have been working at the Army Research Laboratory (ARL) with the On-Chip Energetics team. At ARL, I have been studying the combustion properties of silicon nanoparticles formed by ultrasonic fracture of porous silicon films. For my work, I study the combustion of silicon nanoparticles with various oxidizers using bomb calorimetry, differential scanning calorimetry, and high-speed videography. More recently, I have been exploring binder to use with silicon nanoparticles for additive manufacturing of silicon as an energetic material. Working for ARL, I had the opportunity to present my summer work at the ARL Summer Student Symposium, where I won first place. I am also presenting a poster on my work at the Materials Research Society Fall 2017 meeting. Doing research allowed me to build important skills which I will take into my future career. First and foremost, I have honed my technical communication skills by presenting at conferences, symposiums, and writing publications. Secondly, I have developed good experimental notetaking habits. Finally, I have gained experience working in large teams doing concurrent and overlapping research. Moreover, I have been exposed to a lot of work in the MSE world, and this exposure has given me direction on how I would like to develop my career. I am not sure that I have a favorite class! I have really, genuinely enjoyed all my MSE classes! I enjoyed taking ENMA312 (Experimental Methods in Materials Science) with Dr. Marina Leite because she is a great researcher and passionate teacher, and she holds her students to a high standard. The class was difficult, but I learned a lot of useful lab techniques such as ellipsometry and dynamic light scattering. I also enjoyed Smart Materials with Dr. Manfred Wuttig. Smart materials is probably the downright coolest field in MSE, and Dr. Wuttig is a passionate teacher who genuinely wants his students to understand the material. The best advice I can give another student is that what you get out of an experience depends on what you put into it. If you work hard, make as many connections as you can, and try your best at something, that something (whether that be your classes or your research) will reciprocate. If you are planning on majoring in MSE – or any engineering major for that matter – know that it will be hard, but that’s why we do it. We are engineers because we like solving problems! At school, I co-founded the Materials Engineering Mentoring Organization (MEMO). MEMO aims to connect upperclassmen with incoming freshmen and sophomores to help disseminate wisdom and advice among the MSE undergraduate population. At home, I enjoy running, riding my bike, and doing puzzles. My partner and I are craft-beer enthusiasts, and we like to visit different cities to explore their microbrewing scenes. I have a cat, Lincoln, who helps me unwind when I am stressed out about school. After graduation, I will be working for Fourth Dimension Engineering in Columbia, MD. I will be supporting their initiative toward additive manufacturing of integrated circuits.